The Kirtland’s is one of the most sought-after birds, especially in the springtime when a variety of warblers travel through Indiana, dressed in their most colorful finery, on the way to their breeding grounds. The Kirtland’s is not the most colorful of the warblers, nor is it one of most beautiful singers, but it is quite elusive, making it one of the most prized birds for listers. The Kirtland’s Warbler’s story is one of conservation success. In 1970, they were heading toward extinction. Today, they are rebounding, but their ability to succeed rests largely in our hands. 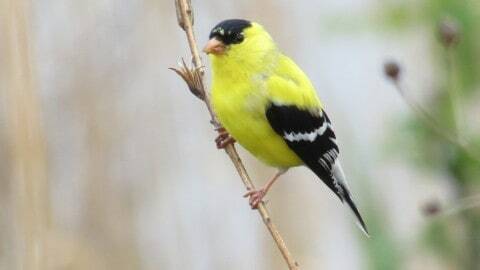 Fortunately, the Kirtland’s has captured the attention of brilliant scientists in the birding world and many studies are underway to determine the best methods of helping these birds continue to prosper. Via email, I spoke with Dr. Nathan Cooper who is at the helm of one of the most comprehensive studies on the Kirtland’s. He and Pete Marra, director of the Smithsonian Migratory Bird Center, obtained funding to study the life history of the Kirtland’s Warblers using geolocators and radio-tracking devices. Dr. Cooper, his assistant Tom Ryan and volunteer David Bryden, are committed to spending time in the field, both in the breeding grounds and in the wintering grounds, to learn more about the birds’ movements, survival rates and habitat use. The first step in the study was to place geolocators on adult birds. The geolocators monitor light levels and give the scientists an indication of the latitude and longitude of the birds. This allows them to track migration patterns and identify wintering locations. In all, 60 adult males were fitted with the devices. Next, the scientists wanted to place radio-tracking devices on 7-day old nestlings. Finding and watching the nests was challenging. Dr. Cooper explains: “If you get too close [the adults] fly away or become anxious and won’t visit the nest. And if you’re too far, you lose them in the dense vegetation.” The transmitters would help the scientists determine survival rates and the habitats used by the fledglings. The news is both good and bad for the chicks. In his blog, Dr. Cooper notes: “Most of our nestlings survived long enough to make it out of the nest…Predation rates during the first few days out of the nest have been fairly high…Causes of death are somewhat unclear…It’s quite difficult to tell what type of animal killed a fledgling even with the carcass in hand.” I asked Dr. Cooper whether he had an educated guess regarding the number of Kirtland’s that are killed by cats. He didn’t have a specific estimate, but he sent me a paper that should be required reading for everyone: “The impact of free-ranging domestic cats on wildlife of the United States” by Loss, Will and Marra, 2012. The study found that domestic cats kill an astounding 1.4 – 3.7 billion birds in the United States every year!